Vegetative propagation—plant cuttings, to you and me—is one of nature’s marvels. When you think about it, it’s quite awe-inspiring that you can stick a twig into a pot and grow a whole new plant. Shrubby herbs, like rosemary, thyme, lavender, sage, marjoram and oregano, are all suitable for taking cuttings, and although you can do it later in the year, when the stems are more mature, I prefer to take softwood cuttings in the spring, when the bushes are bursting with new energy and fresh growth. The exact time depends on how early or late spring arrives, but you want young growth of several inches in length. Of course, it’s not always successful. In fact, it’s quite unusual if every one of your cuttings succeeds. However, you can increase the chances by giving them optimum conditions. Using the right growing medium is important. It needs to be open and well-drained, to allow oxygen to reach the stem, and to remain moist but nowhere near waterlogged. I generally mix potting compost with about the same volume of horticultural sand. Sand is cheaper, but you could use vermiculite or perlite instead. Don’t worry about soil fertility. Rooting relies on the energy in the cutting, not nutrients in the soil. Some people use pure sand. However, I found that this remained dense and wet and I’ve had little success without combining it with compost. Sift some dry sand over the surface, or cover with vermiculite in order to reduce the chance of the stem rotting at the point where it submerges. It’s best to take cuttings in the morning. If the weather has been dry, water the plant the day before. This ensures that the cuttings are as firm and fresh as possible. Look for new side-shoots that don’t carry flower-buds, take more cuttings than you want (to allow for failures) and get them to the potting bench as soon as you can. You want to cut these shoots down to around 2-4 inches in length. Use a very sharp blade, so that you don’t crush the stem, and cut just beneath a leaf node (where a leaf is joined to the stem). This is where the plant’s own rooting hormones are most active. Cut the stem at an angle, as this increases the surface area available for rooting. Remove the lower leaves, leaving around an inch or two of the stem bare. Removing these leaves not only helps prevent rotting, but encourages root formation at those points. Some people dip the cuttings in rooting powder, but don’t feel you have to. It doesn’t guarantee success anyway. Using a dibber or pencil to make the planting holes, insert three or four cuttings around the edge of a 10 cm (4-inch) pot and ensure that you firm the soil into place so that the points at which the roots may form are in close contact with the soil. The cuttings now need high humidity because this reduces the rate at which they lose water through their leaves—without roots, the cuttings cannot yet replace any water lost. 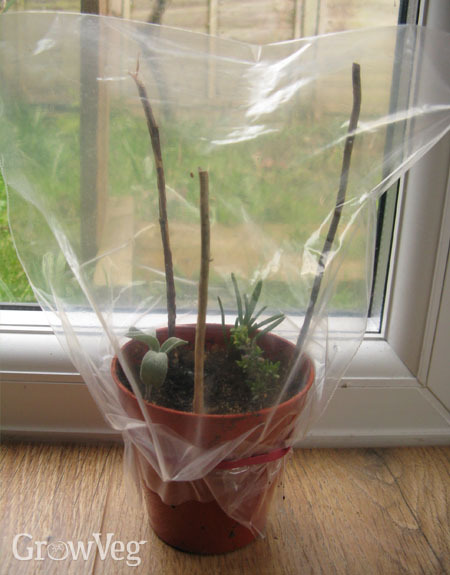 You could put a clear plastic bag over the top and secure it with an elastic band around the pot but you need to be careful that the plastic doesn’t touch the cuttings (you could support it with twigs or wire). I find rigid plastic is better (perhaps a drinks bottle with the bottom cut off) as it’s much easier to remove the cover every day or so to allow air to circulate and reduce the possibility of mould. However, you still need to ensure that the leaves don’t touch the plastic. Put the pots in good light, but out of direct sunlight, which will frazzle the leaves. Bottom heat isn’t necessary—my cuttings generally sit in an unheated outhouse—but if you do have space available in a propagator then the extra heat should speed up response time. Keep the growing medium moist (but not sodden), remove anything that shows signs of mould, and keep your fingers crossed. The length of time it takes to strike a cutting varies. I usually find they root in around three weeks, but it can be longer. Keep an eye open for new growth. Immediately it’s clear that the cutting has taken, then pot up individually into 4-inch pots and, when they’ve filled that, either pot on or harden off and transplant into the garden. "This will be my first attempt at taking cuttings f..."
"I gave a class last year about herbs and didn't want to by new plants, because it was so expensive. so, I did enough cuttings for 20 people and had great success. they in turn brought their plants indoors gradually and were able to take cuttings and get them started for this year. Walmart stayed out of their pockets! Everybody works together using fresh herbs in all their recipes. for the most part they say they have saved so much money growing and using their own herbs "
"I have been growing Mint from cuttings planted in Feb. The roots sprout in 15 days and by mid April the first harvesting can be done. Themint keeps growing and you can take a harvest every 15-20 days." "Sounds good, Lora. Once you've had success, taking cuttings can be quite addictive. And as Barb says, you can save so much money in the long run. Mint is pretty insuppressible - I usually take root cuttings if I want more. " "I do not know if it is my computer or your website but there is a strip of writiing superimposed on the "how to take cuttings of herbs" page. How can I get rid of it so that I can read the article?" "Rod - it doesn't appear to be our website - everything is working well here. Have you tried restarting your computer?" "Last year, I tried some more lavender cuttings in different combinations. The one that rooted best and grew well quickly, I grew in 1/3 sharp sand, 1/3 cocopeat and 1/3 ordinary potting compost. The cocopeat is quite coarse and airy which really helped the soil to stay open even after watering regularly. I also found little terracotta clay pots work better than plastic pots to reduce mould and humidity problems. You do need to keep a closer eye on the moisture though as the clay allows more water to evaporate. " "I surely will try this, it looks like a fun try. " "It enlarge my knowledge on the point!Thank You for the post. I love to read interesting post that has knowledge to impart. I hope to read more articles from you .Keep up the good work! http://bioactivepeat.com.au "
"would like to try this. Thank you"